I found a 1990 Suzuki Across at a wreckers, I bought the complete bike minus engine for $800. It had been dropped with most of the damage being done to the front panels. It needed a good going over and a new paint job (the picture left is after the panel repair and respray, its not all together yet). The original colour was black with a metallic fleck through it. I think the new paint will make it standout a bit more. I am also replacing the screws that hold the panels on with stainless steel allen key screws. I cleaned up the frame and touched up the paint. Also recovered the seat. There is heaps of room where the engine and petrol tank was for the electric motor, batteries and controllers. 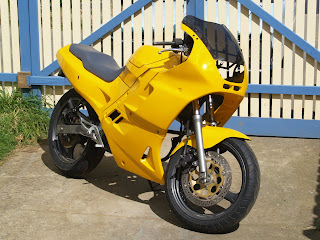 After taking these factor into consideration the ideal bike to convert was the Suzuki Across. They are classed as sports-touring. The Across is fully faired so the aerodynamics are pretty good (at worst they are better than a cruiser), also the conversion can be hidden underneath the fairings with the main thing to distinguish it as different would be the absence of the tailpipe. The bike is relatively light weighing in at 160kg dry according to spec sheet. The Bike is big enough that i would be comfortable riding it (I'm 6" tall). They are getting old now so they are cheap to buy and get parts for. The other big advantage to the Suzuki Across is where the petrol tank is on a normal bike the Across has a boot big enough to fit a large helmet, and the petrol tank is under the set. This is perfect for the electric motorcycle because the unused petrol tank can be removed without affecting the look of the bike. The aims of the Open Electric Motorcycle Project are to take an existing motorcycle and to convert it to be an electric vehicle, this bike is then going to be registered and use for daily commuting. Using an existing motorcycle eliminates the need to design and engineer a complete bike. Only the electric motor brackets and battery pack will be need to be engineered for registration. The time in building a bike from scratch takes a lot of time and resources too. A range of at least 100 kilometers is required. A top speed of at least 100kph is required. All schematics and software for the battery management and motor control are released as open source.